On the 29th, a number of layouts around the Bay Area had crews assigned for operation. These were primarily out-of-town people who had signed up to operate. As usual, I hosted four people to operate on my layout as two two-person crews, and we were scheduled from 10 AM to 1 PM. But for me, this was not a routine operating session, because I have been upgrading a number of parts of the layout in preparation for the Bay Rails weekend in March, something held in odd-numbered years in the Bay Area. So in addition to the usual car flow and so on, I was also testing some aspects of the upgrades. I also wanted to exercise a few more cars which have not been part of op sessions recently, to broaden my “first class” operating fleet. Inevitably, a few did not perform as desired, and are now on the workbench for correction. But with 52 cars on the layout for this session, many of which were repeatedly switched, and a few of them that were rarely or never previously operated, having a few cars falling short wasn’t too bad. One of the crews was Bernhard Beck (left) and Lloyd Lehrer, shown here working their first shift at Ballard. 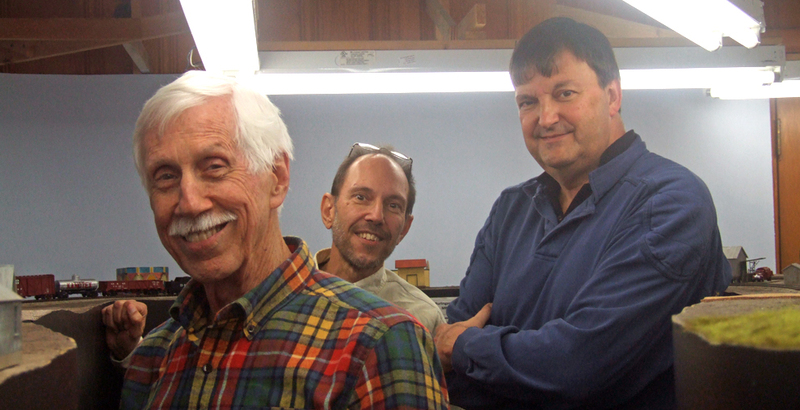 The other crew, here working at Shumala, was Wayne Wood (left) and Paul Chandler. None of these guys had operated here before, so naturally there was time spent figuring out the various switching complications and setting up the successive moves that had to be made. I know they enjoyed the challenge. And Paul Chandler voiced the reality we all recognize, when he said, “This was our first day on this job. 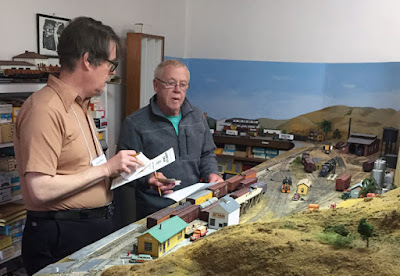 Once we’ve done it every day for a few weeks, we will be a lot quicker.” That’s just one of the difference between model railroad crews and prototype crews. But from my perspective, in terms of the layout and the rolling stock, it went pretty well, and just as I had hoped, revealed things that need improvement before Bay Rails. In this installment of my continuing series on electrical issues and (one hopes) their resolution, I identify another gremlin with which I have wrestled mightily and achieved a draw. Or maybe a narrow victory on points. 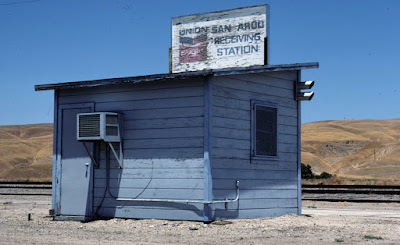 The topic this time follows, in a sense, from a previous post about progress at my branchline-end town of Santa Rosalia, which can be found here: http://modelingthesp.blogspot.com/2016/12/progress-at-santa-rosalia.html . 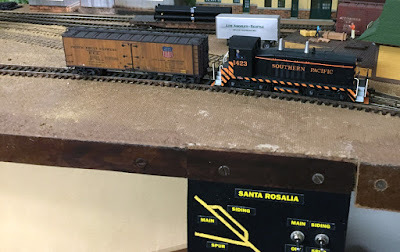 At the far end of my Santa Rosalia branch there is a switchback connection to an industrial spur and also a siding on the main line. The most compact way to switch this is with a three-way turnout. I used the Peco Code 75 asymmetrical turnout here, their number SL-E199. It’s an excellent product and mechanically it works flawlessly. It’s shown below installed, with some ballasting remaining to be done within the turnout itself. It’s called “asymmetrical” because the two throwbars, visible here, are at different locations, and the two side tracks diverge asymmetrically from the center track. On my layout, as this photo illustrates, the upper diverging track is a siding off the main, and the lower one is an industrial spur. Peco supplies an instruction sheet for this, which can be found at: http://www.peco-uk.com/imageselector/Files/Instruction%20sheets/HO-OO%20Code%2075%203-Way%20SL-E199.pdf . Electrical connections with this kind of turnout are necessarily complex, with two sets of points in close proximity. Peco recommends using a pair of their own SPDT (single pole double throw) switches here, in combination with two of their switch machines (which they call “point motors”). I like their switch machines, which are sturdy and dependable, but they do require a rather mammoth hole in the layout to place them, and then they are buried under the track and scenery. Or you can excavate that big hole clear through the track support (Homasote plus plywood or whatever you use), and then the switch machines are accessible from below. I didn’t really want to follow either path. 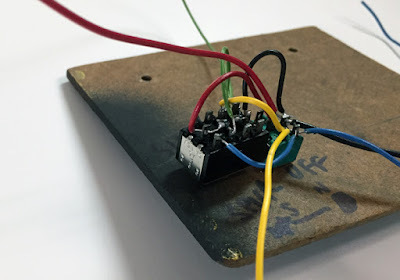 I had the thought that the turnout could remain hand-thrown, as Pecos are designed to be, and then I could do the electrical power routing with a couple of switches. But when I contacted Peco through their modelers’ online Q & A, they replied that it wasn’t really possible, but that you had to use their own switches and, preferably, their own switch machines. Since I didn’t want to do that, the situation immediately became a challenge, and I decided to see how I could do it. Checking my stash of electrical parts, I have a bunch of double-throw switches, but not SPDT ones, so I decided to just use what I have. As Peco themselves observe, there are a number of ways to wire this turnout, so I chose one that appeared like it could work for me. Below is the Peco diagram for this switch, which, please note, is viewed from the bottom. (That is why the drawing is, if you will, reversed in its asymmetry from the photo above.) The switch is delivered with the three wires (numbered 1, 2, and 3) already installed. This diagram shows the Peco SPDT switches installed, which I wasn't going to do. I decided to wire the contacts of two electrical switches. Essentially one pole of one switch connects the South track feed to both wires 2 and 3 (the siding), while the other pole connects the North feed to wires 1 and 3 (the spur). I used the second switch to serve the main (center) track, connecting North to wire 2 and South to wire 1. I used a DPDT (double pole, double throw) switch for the main track contacts, and a 4PDT switch to handle the siding and spur contacts (I could have used two DPDT switches but had a 4PDT one on hand). This of course made a bit of a maze of wire behind my small control panel (the construction and decoration of that panel are shown in a prior post (at: http://modelingthesp.blogspot.com/2016/12/progress-at-santa-rosalia.html ). But that’s just a matter of getting all the wires in the right places. Most of this is no. 22 wire, big enough for leads of three inches or so to the terminal strip. 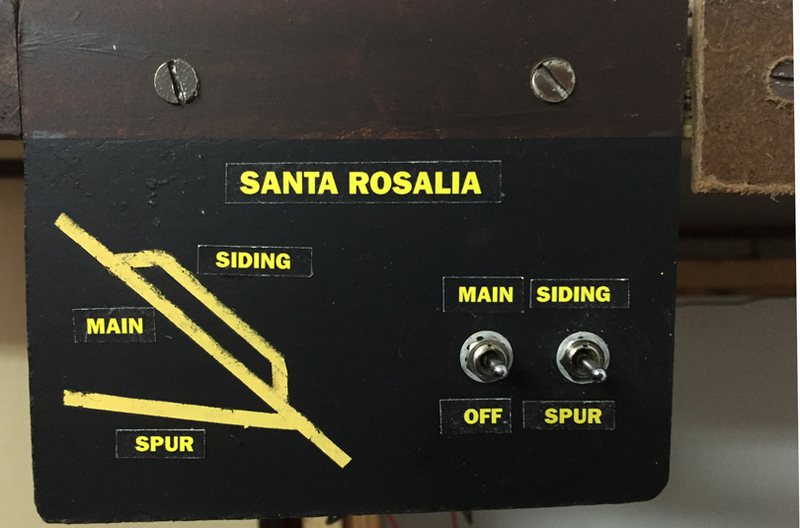 With this wiring complete, the panel could receive final installation on the layout edge at Santa Rosalia. Here is its completed appearance, with all lettering. The panel was apparently wired correctly, since tests with switcher SP 1423 were fine. Here is the switcher moving a PFE car to Coastal Citrus on the spur for the first time. It will be nice to have all the switching at Santa Rosalia enabled, and will bring three more industries into play, which is always interesting. I built the Coastal Citrus structure some years ago, and it’s been waiting for quite awhile for the railroad spur to reach it! Now it does. I began this series of posts with some background on Richfield Oil Company, with reference to previous posts about bulk oil dealers (see the introduction at: http://modelingthesp.blogspot.com/2016/12/more-bulk-oil-modifying-interstate-oil.html ). In that post, I also showed how I wanted to begin modifying the Walthers structure kit, named Interstate Fuel & Oil (kit no. 3006), for my layout. The two posts that followed showed some early details of modifying I did to parts of the kit, first the construction of the removable roof to replace the kit's distinctive round roof (the post describing that technique is at this link: http://modelingthesp.blogspot.com/2016/12/more-on-modifying-interstate-oil.html ), with the goal of making a gable roof to replace the round one. The third post then presented some additional description about modifications I made to the storage tanks (you can see that post here: http://modelingthesp.blogspot.com/2017/01/modifying-interstate-oil-part-3.html ). In the present post, I continue with the roof treatment introduced in the second post. I built the removable roof with Evergreen no. 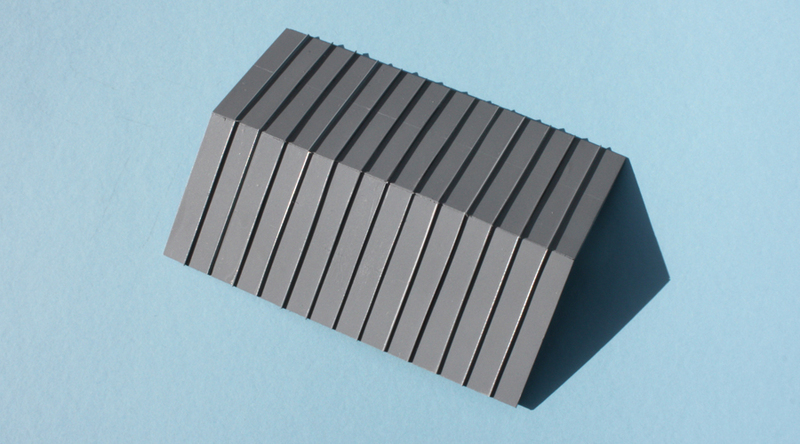 4523 metal roofing material, which makes a standing-seam roof. 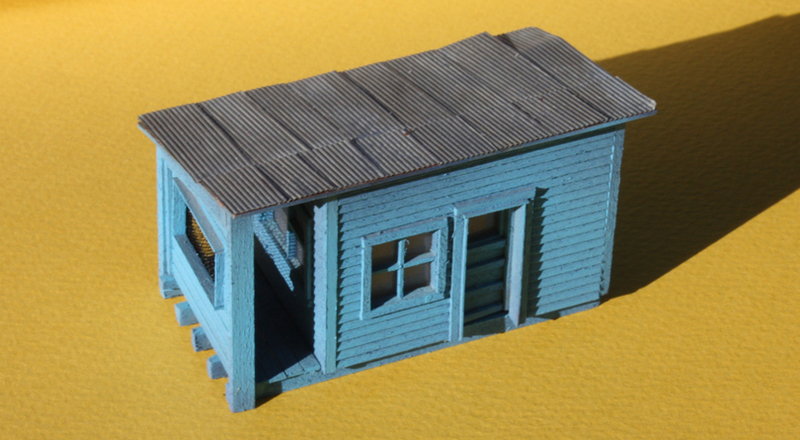 I have used this material before to build roofs, for example in the machine shop I added to my roundhouse at the layout town of Shumala (here is a link to the post about that model: http://modelingthesp.blogspot.com/2014/01/shumala-roundhouse-part-3-machine-shop.html ). Thus I know that assembling these roofs is a little tedious and fiddly, getting the styrene strips which represent the seams to line up in the grooves in the roof sheet, but this is one of those cases where patience gets you to the destination. Once the roof was complete, I painted it and the other roofs in the kit a medium gray, using Testor’s gray primer. Then I could also complete assembly of the pump house in the kit, using the previously painted yellow walls and blue doors. I will eventually weather this building to a fair extent, since it presumably would not have been maintained as well as the publicly accessible warehouse/office building. Shown below is that warehouse/office building with its new roof, together with the kit loading docks wrapping around one corner. I still need to add a prominent Richfield sign to the building; the obvious location is the empty wall space on the building end, between the windows. I will also of course add various items to the loading docks, not only some of the oil drums from the kit, but also pallets and boxes. It might also be appropriate to add some advertising signs, for example for Richfield lubricants and gasoline. These are readily available on the Internet. The kit modifications so far are working well for me, and I will report further progress on this layout structure in a future post or two. I always enjoy seeing another of my layout industries coming together, and already look forward to switching cars at this one. I think most modelers recognize that the short cylinders on top of tank car domes are safety valves. 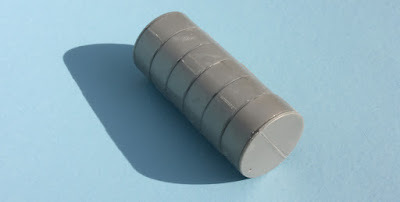 They are a spring-loaded valve that can be set to the desired release pressure (for example, 35 pounds per square inch for a garden-variety ICC 103 tank car). The purpose of course is to prevent excessive pressure from developing inside a tank car. 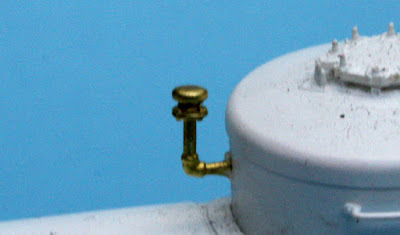 As I showed in my tank car article in the Model Railroad Hobbyist issue for February 2016 (you can view or download any issue of MRH, any time, for free at their website, www.mrhmag.com ), safety valves can be mounted on top of the dome or on an elbow pipe at the side of the dome, but the interior parts of the valve are identical. What modelers are usually less familiar with are safety vents. There are several kinds of these, and they are primarily used for tank car cargoes that do not give off flammable vapors nor are otherwise toxic or dangerous. Such cargoes include vegetable oil, wine, molasses, glycerin, vinegar, and so on. (Vents were also approved for some corrosive cargoes.) These vents have a distinctive appearance, and are readily perceived as different from safety valves. They too could be mounted on the dome top or side. Here are a couple of examples. These are details of photos in the Richard Hendrickson collection. Both cars shown happen to be cars in wine service. The requirement for expansion capacity, which was the purpose of the dome, was that the dome size had to be at least 2 percent of the tank volume. 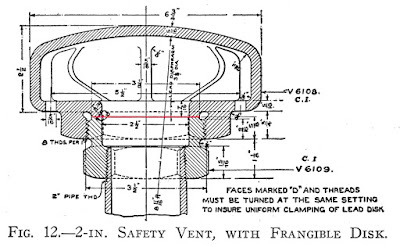 It is worth noting that, as with safety valves, the side mounting reduced the dome volume complying with the 2 percent rule, because only the volume below the side mount could be counted toward the 2 percent. After about 1925, new tank cars generally had their safety valves or vents, whichever was used, mounted on the dome top. But older car conversions or upgrades sometimes received side-mount vents. 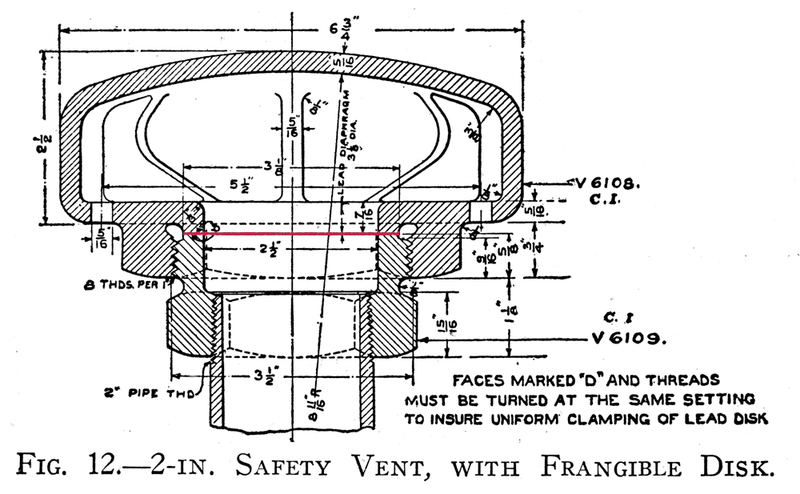 The standard design of these vents, with two-inch inside diameter, is shown in the drawing below (from the 1919 Car Builders Cyclopedia). The key component is indicated in the center, a lead metal diaphragm or disk, about 1/16-inch thick, which is prepared so as to have a rupture pressure of not more than 30 pounds per square inch. The disk is highlighted in red (you may click to enlarge). Obviously if the disk ruptures, the vent must be disassembled to replace it. This safety vent is the working part of the vents shown in the prototype photos above. These frangible-disk vents are not for most tank cars. 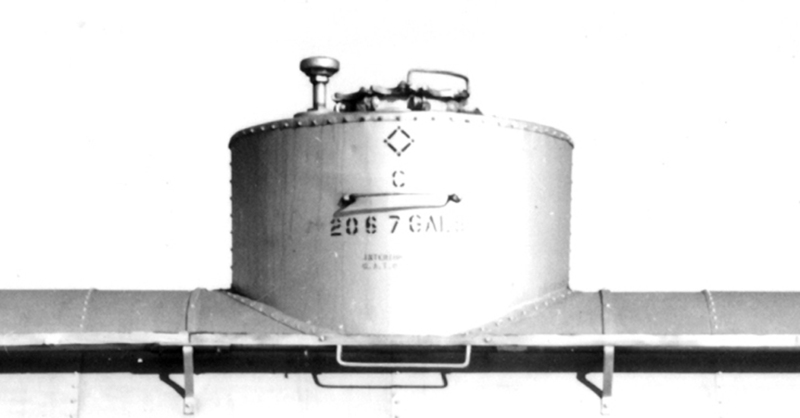 In fact, any tank car equipped with them was recommended to be labeled, “not for inflammable liquids.” But for edible oils, wine, and other cargoes without significant vapor pressure of flammable vapors, these vents were fine. They were not only cheaper as first cost, but did not have to be periodically tested as did safety valves. And on the modeling side, they are essential for modeling some kinds of tank cars. 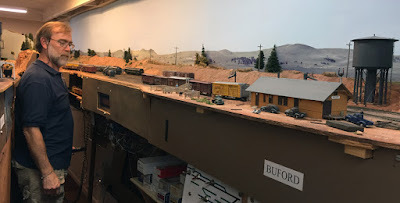 I introduced the topic of my bulk oil dealer for the layout town of Santa Rosalia, intended to be a dealer for Richfield Oil Company, in the first post in this series (at: http://modelingthesp.blogspot.com/2016/12/more-bulk-oil-modifying-interstate-oil.html ). 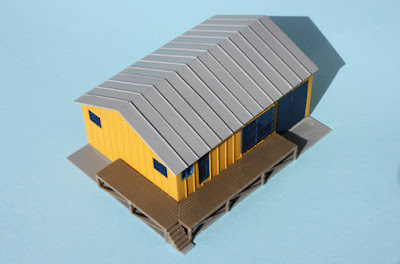 I showed some of the first modeling steps in a follow-up post, concentrating on replacing the distinctive round roof of the warehouse structure in the kit with a gable roof (that post is at this link: http://modelingthesp.blogspot.com/2016/12/more-on-modifying-interstate-oil.html ). In the present post, I continue with the project. I mentioned in the previous post in this series (link just above) that I would want to re-arrange the elements of this kit to better fit my space on the layout. The kit seems intended for an almost square space, whereas my space is longer than it is wide. 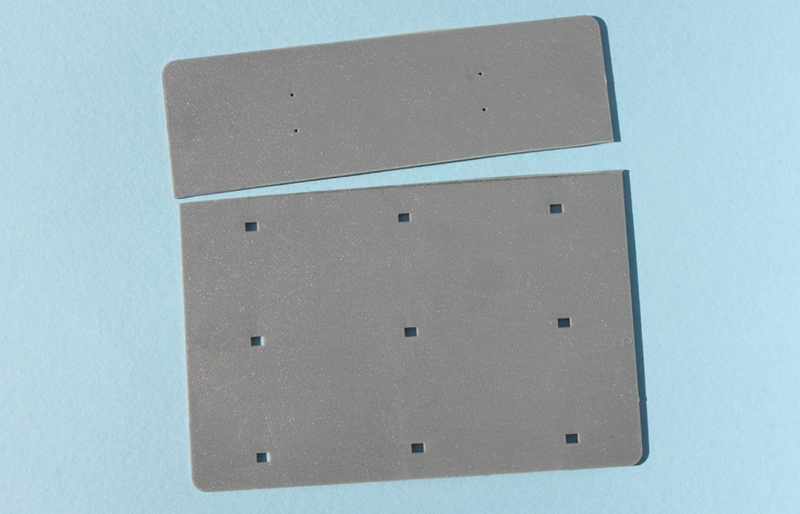 One bulky and rather square element in the kit is the base for the horizontal tanks, which includes the truck loading dock. After experimenting with the various kit base parts on my layout, I decided I needed to divide those two parts, making the truck dock separate. I measured the tank base so it had as much width for both ends of the tanks, and then scribed and snapped that base. This separation meant I could arrange the truck dock separately, as best fitted my site. Next, I decided to build only two, not three, horizontal tanks, and accordingly took the tank part of the base, shown above, and measured it in thirds, to scribe and snap into a smaller tank base, as shown below. Meanwhile, I was addressing the tank moldings. As mentioned in the first post (link provided at the top of the present post), the seams (called “weld lines” in the kit instructions) are immense, far larger than any weld on the planet. They could possible represent some kind of crimped seam, but hardly can be welds. In any case, I decided to reduce their size considerably, by filing them down. Though a little tedious, this goes quickly with a 00 size mill file, followed by cleaning up with a small, flat Swiss file. The goal was not to entirely remove these indications of seams, only to make them much less prominent. You can see the degree of my success in this assembled tank (to be one of the horizontal ones), with distinctly less prominent seams. When painted, I believe these will be even less evident. I am pleased with how my modification to this kit are progressing. I hope to have some of the elements completed in a following post. 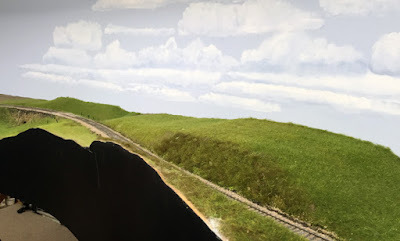 As part of my trip to Florida for this year’s Prototype Rails meeting at Cocoa Beach (which I described at some length in a previous post, which can be found here: http://modelingthesp.blogspot.com/2017/01/cocoa-beach-2017.html ), I also visited a couple of layouts to operate. In the present post, I will say a little about each. In the time before the Cocoa Beach meeting, I visited Mike Brock’s impressive Union Pacific layout, depicting the Laramie area and parts of Sherman Hill. Mike has rendered the scenic appearance of that area wonderfully well. As usual, he had set up a sequence of trains, and a number of us participated in the operation. One of my tasks was the yard switcher, 0-6-0 no. 4466, fun to run with full sound. Also seen switching was Bruce Smith at Buford, where he was organizing a string of stock cars with a 2-8-2. Here again, the DCC and sound made this fun. Waiting at Buford (just out of sight to the right in the photo above) for a green signal was 4-12-2 no. 9003, an example of the kind of massive steam power appropriate to and practically required for a Sherman Hill operation. After the meeting, I traveled to Athens, Georgia to operate on Jared Harper’s layout, modeling the Alma (Kansas) branch of the Santa Fe during World War II. 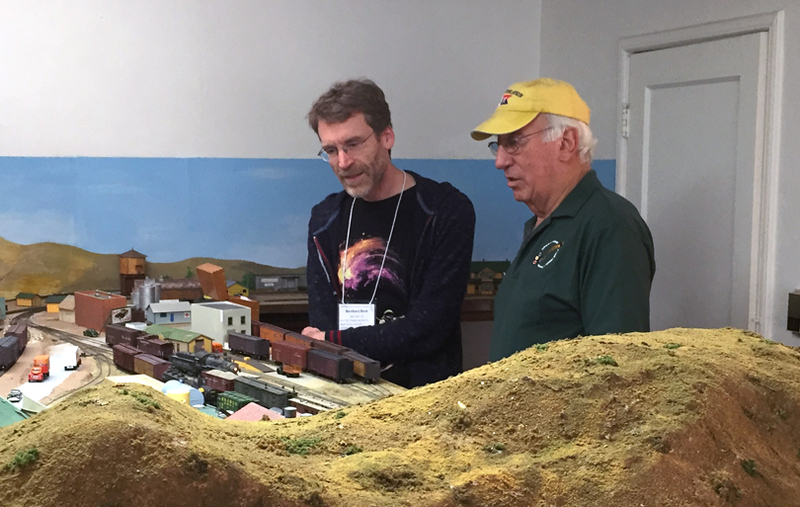 Jared has researched a great deal about the area in which the layout is set, including interviewing residents of the area, and thus the operation can mimic the actual train procedures on this branch quite closely. 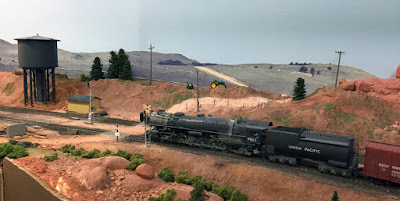 For more about the background and specifics of the layout, you can read about it in the Model Railroad Planning issue for 2009. Included there is the modified John Armstrong track plan that Jared has built. I was pleased that an old friend, Scott Chatfield, was able to come over from Atlanta to join our crew. 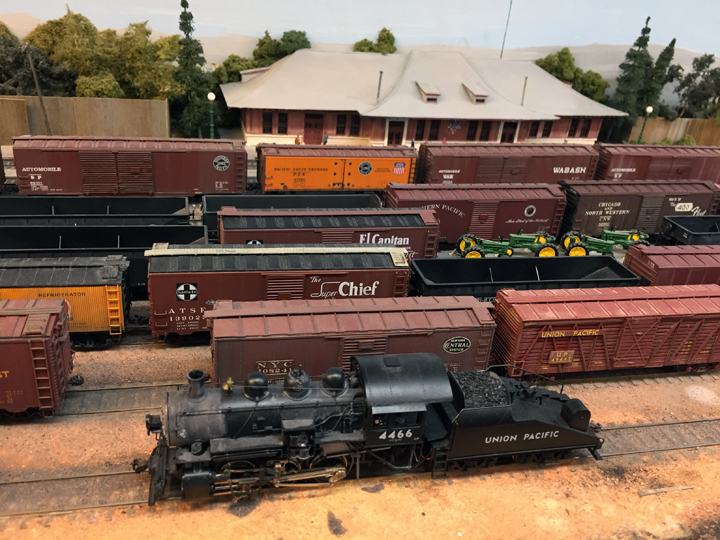 Scott is not only very knowledgeable about freight cars, but worked as a professional railroader at one time, and thus brings a strong dose of reality to model operations. Also present was Claus Schlund, a San Francisco resident but able to join us from his Florida vacation home. Here is the photo Jared took of our crew. That’s me at left, Claus in the center, and Scott at right. Traffic on the prototype branch, 33 miles long, is dominated by livestock, as every single town has a stock pen. There are also bulk oil dealers (one of my favorite subjects) in all the larger towns. But my favorite scenic area was Eskridge Hill, which the train climbs just west of the town of Eskridge. Here is a view of the lush spring grass on the hill (it’s May of 1943). Once the crew has traversed the entire branch and done all the trailing point switching on the way to the branch end at Alma, the locomotive is turned on the wye and returns to the starting point, Burlingame, now doing all the remaining switching, which is now also trailing point. 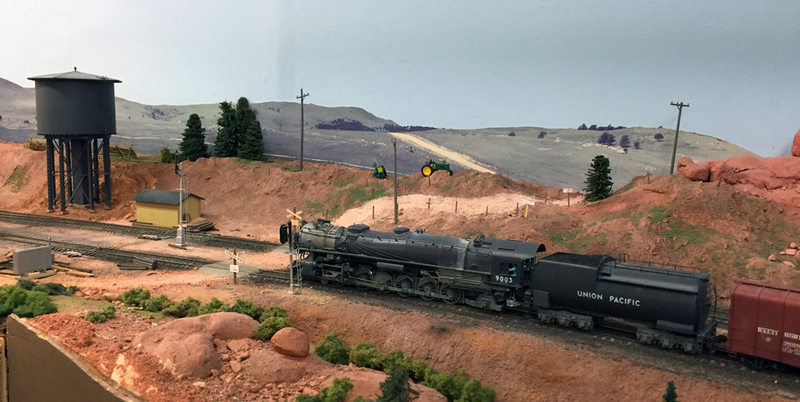 Here is our train, with stand-in locomotive 9441 on the point, crossing Bridge 3-A as it nears Burlingame. Both these layouts were visually interesting and fun to operate. Both are very much in progress, with areas still needing work, but nevertheless plenty well enough developed to enjoy, I had fun at both of them, and thanks again to both hosts for putting on the sessions. Among the modeling items I inherited from Richard Hendrickson were several in-progress car projects. One of these was a W&LE gondola, which I described completing in an earlier post (you can find that post at: http://modelingthesp.blogspot.com/2015/05/completing-richard-hendrickson-freight.html ). Another project I showed, though I have not completed it, was a 65-foot mill gondola. I presented the project as it currently stands, including a special tool, in a post last July (it is at this link: http://modelingthesp.blogspot.com/2016/07/an-interesting-hendrickson-gondola.html ). The present post describes a third such project, a rebuilt automobile car, which required some sleuthing. The reason for the sleuthing was that the model had reached a state of having the body almost completed, mostly needing detail parts, but I could not figure out what prototype was being modeled. But at Cocoa Beach last week (see my post about the meeting: http://modelingthesp.blogspot.com/2017/01/cocoa-beach-2017.html ), John Barry provided a probable prototype, the Santa Fe rebuilt automobile cars, and upon returning home, I turned to my copy of Richard’s book, Furniture and Automobile Cars, Volume 3 of the series, Santa Fe Railway Rolling Stock Reference Series, published by the Santa Fe Railway Historical & Modeling Society, 1997. I quickly discovered that John was right. The model Richard was building was going to be a car of Santa Fe Class FE-25. 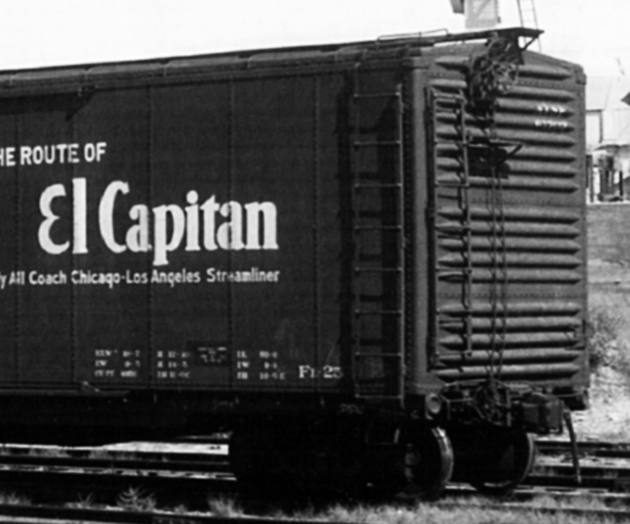 These Pullman photos are from the California State Railroad Museum (CSRM). 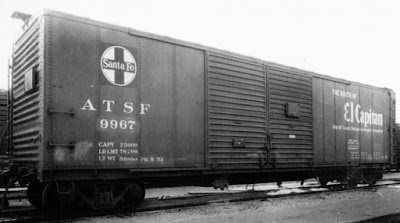 In wartime 1943, Santa Fe was able to obtain some steel for rebuilding cars, and rebuilt the entirety of the surviving cars of FE-Q into more modern automobile cars. They got new steel roofs of the straight-panel design; new sides with an interesting side-sheet pattern, completely replacing any trace of the original sectional sides; new doors; and the original ends were extended in height, but kept the original underframe. The result was the FE-25 cars. 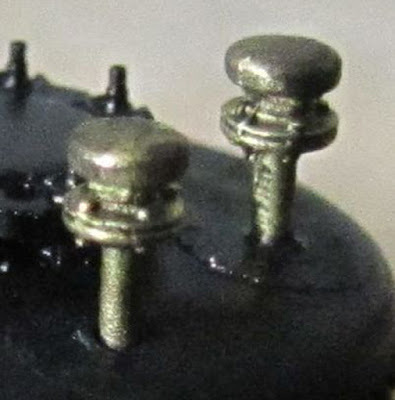 Shown below is a detail from a Virl Davis photo of one of these cars, clearly depicting the added top rib on the 7-5-5 original ends. You can also see the Ajax hand brake added in the rebuild. The shadows show that the brake step and running board are wood planks. 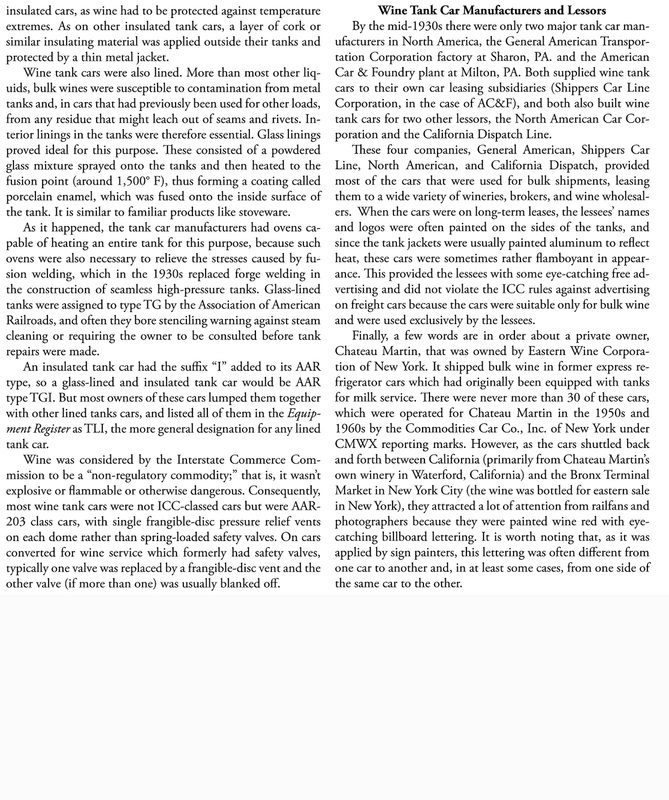 Late in the 1930s, some buyers of 50-foot automobile cars changed from the first design of 50-foot double-door cars, which had four side sheets to the left of the door opening and six to the right (called 4-6), with additional panels (and interior supporting posts), in a 4-7 arrangement, with unequal panel widths to the right of the door. In 1942, this became the AAR Recommended Practice, and though not all railroads followed it, clearly the Santa Fe did. The FE-25 rebuilds had the 4-7 pattern. This is shown below in a Santa Fe photo from CSRM. 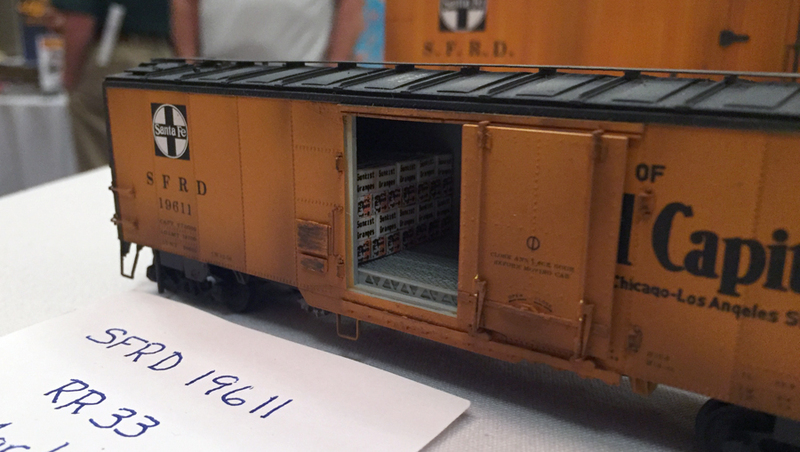 Richard’s model of this Santa Fe class began with an Athearn automobile car. He kept the floor and sides, which are the correct 4-7 pattern, with three narrower panels to the right of the door opening (see photo above). He acquired but had not added a replacement straight-panel roof (since the Athearn roof has one too many panels). Ends of course had to be replaced, and the wider car body also meant that the surviving underframe had a side sill narrower than the new body, a common situation in rebuilds of older cars. I won’t show all those model features in this post, but will present a side view to illustrate the 4-7 panel pattern. Note also the AB brake valve located near the side sill (indicated by the arrow), as can be seen above in the photo of ATSF 9967. 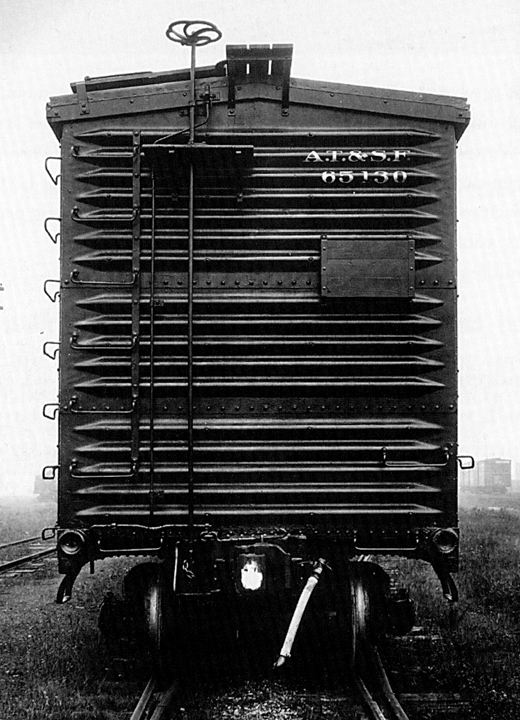 The fishbelly underframe, derived from an Athearn gondola, is also visible. I am now at work with the effort needed to complete this model project as a Santa Fe FE-25. I will show additional work as it progresses, in future posts. 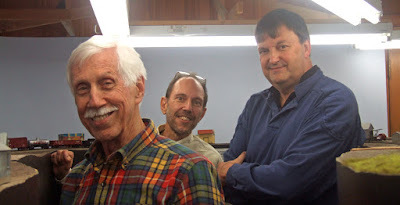 Last week the 16th annual Prototype Rails meeting was held at Cocoa Beach, Florida, in the same Hilton Hotel we have used every year, and once again under the able direction of Mike Brock, Jeff Aley, Marty Megregian, Scott Dam, and a crew of volunteers. I always enjoy this meeting and look forward to it every year. As always the model displays were a lot of fun and endlessly interesting and informative. I will show here just a few of the models I photographed. First up is an impressive HO scale model of an SFRD reefer of Class Rr-33, modified from a C&BT Shops kit. The open door reveals crates of produce inside. The fine model is by Ed Martin. 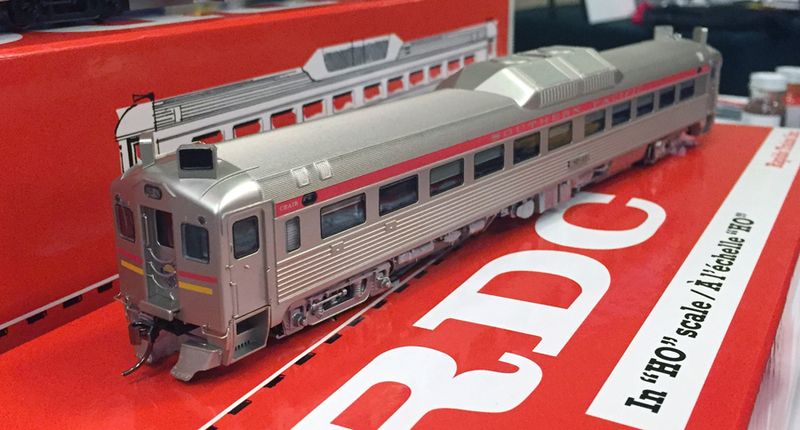 Also, I should mention the new Rapido model of the Budd RDC cars, particularly the Southern Pacific car, no. 10. Here it is in the original paint. Having picked it up and examined it on all sides, including the underbody, I can tell you this is a beautiful model. Kudos to Rapido! I always enjoy those whose modern modeling does include graffiti, as these are so prevalent today. 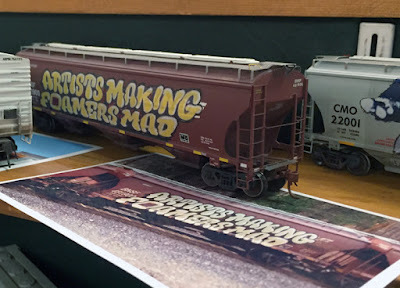 In fact, anyone modeling a time in the last 25 years who does not have freight cars with graffiti can fairly be accused of not being prototypical. This one I thought was really fun, and the prototype photo is right in front of it. Most modelers who bring things “in progress” also provide a brief description of what they are doing. This model by Bill Welch (who styled himself “The Reluctant Weatherer”) is a good example. I was especially interested in this particular kitbash because I want to make some of the SP gondolas of Class G-50-20 by a similar method. Once again, as in the past, this was a great meeting and I really had fun. I should perhaps mention also that I did present a clinic at the meeting, on “Wine Tank Cars,” and that of course was the reason for the prior post in this blog (you can read it at: http://modelingthesp.blogspot.com/2017/01/handout-for-wine-tank-cars.html ). I am sure I will plan to continue making the long plane flight to and from Florida in future years to enjoy this meeting. This is a handout for a clinic about tank cars used to transport wine. It represents a kind of second edition of a clinic presented in 2010 by my good friend Richard Hendrickson. He and I had shared ideas and resources in developing that talk, but the final product then was entirely Richard's and was presented by him. But some aspects of the topic, such as information about the wine business and about modeling of wine tank cars, did not get included. I wanted to round out the talk with those topics inserted. Having retrieved Richard's talk files from his computer, I reorganized the material somewhat and added the parts I felt were missing, resulted in the current talk. I have written two earlier blog posts which relate to the topic of this clinic. 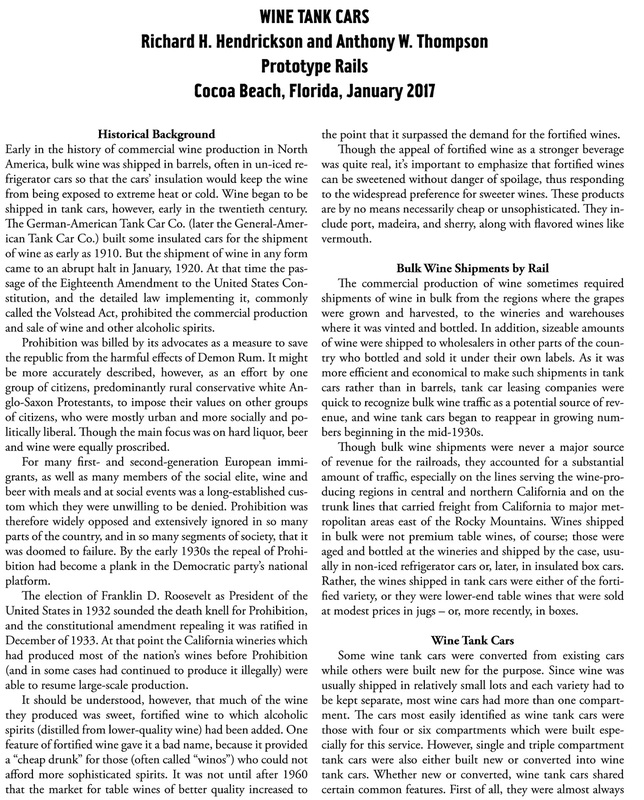 One of them was focused on the subject of wine as an industrial commodity, since understanding the wine business itself is essential to understanding the rail shipping side of the topic. 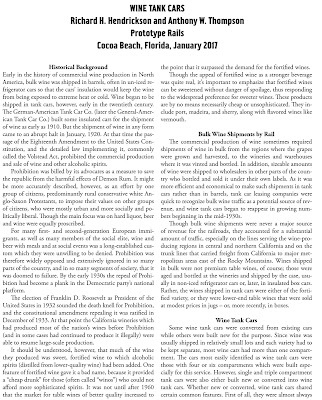 That post should provide additional background to material that was presented in the talk (here is the link: http://modelingthesp.blogspot.com/2012/02/wine-as-industrial-commodity.html ). A follow-up post had a simplified introduction to the subject of wine tank cars, prototype and model, and it can be found at this link: http://modelingthesp.blogspot.com/2014/08/wine-tank-cars.html . http://www.lulu.com/shop/ian-cranstone/tank-car-capacities-1955/hardcover/product-22351502.html . The Gibson Wine cars I showed can be modeled with Protocraft Decals; see http://protocraft.com/Majors.cfm?ID=1 . The frangible-disk type of safety vent, upright or elbow, is available from Owl Mountain Models in HO scale; see their parts page at : http://www.owlmtmodels.com/detail_parts/detail_parts.html#Vents . I only had a few moments to talk about Chateau Martin and its wine cars. For a really complete and interesting description, you may visit Jim Lancaster’s excellent web page on this topic, which may be found at: http://coastdaylight.com/chatmart/cmwx_roster_1.html . 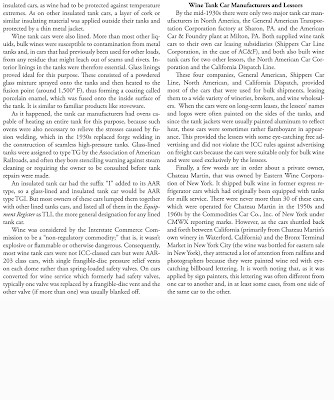 Having said a little in the talk about scratchbuilding a wine tank car, the basic method used was described fairly thoroughly in my article in Railroad Model Craftsman, in the issue for January 2012. 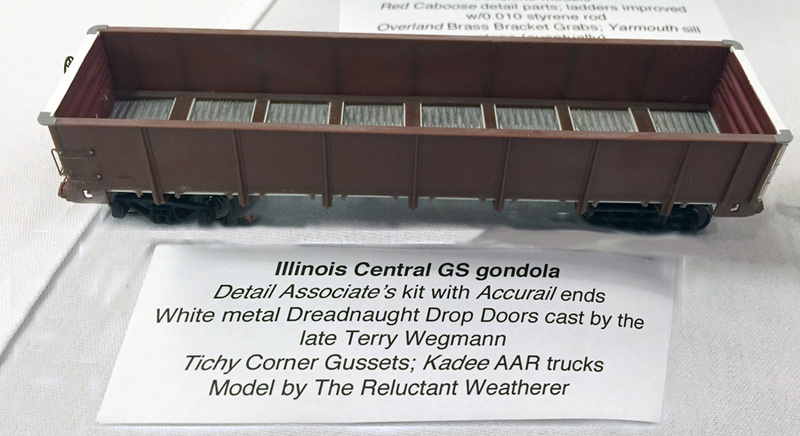 Finally, I mentioned the ex-Proto2000 insulated tank cars now sold by Walthers. This was a convention car for the NMRA National Convention in Sacramento in 2011, and was produced for the convention committee. A few of these convention cars are still for sale, at a reduced price of $10 plus shipping. To buy one, go to this site: www.X2011west.org/store.html . These ready-to-run cars offer an easy way to get some wine cars on your layout, and are easily relettered. Richard had also drafted a text summary of his talk but not finished it; he had also started to add some modeling photos to the talk. I took on the challenge of completing and updating these materials, along with adding the extension topics I put into the talk. I show the two pages of our text below. You can click on these to enlarge them, and can download for your own use if you wish. It has been interesting and fun to fill out Richard’s talk to reach the vision he and I had discussed originally. I hope this handout version is helpful and extends some of the content of the oral presentation. As I did at the talk itself, I will be happy to take questions. 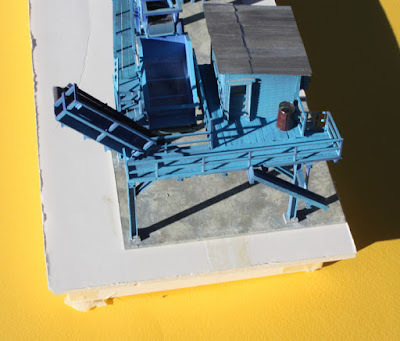 This post is to show photos of a beautiful model of a sugar beet loader, built in HO scale by John Tabler and loaned to me for photography by Chuck Catania. 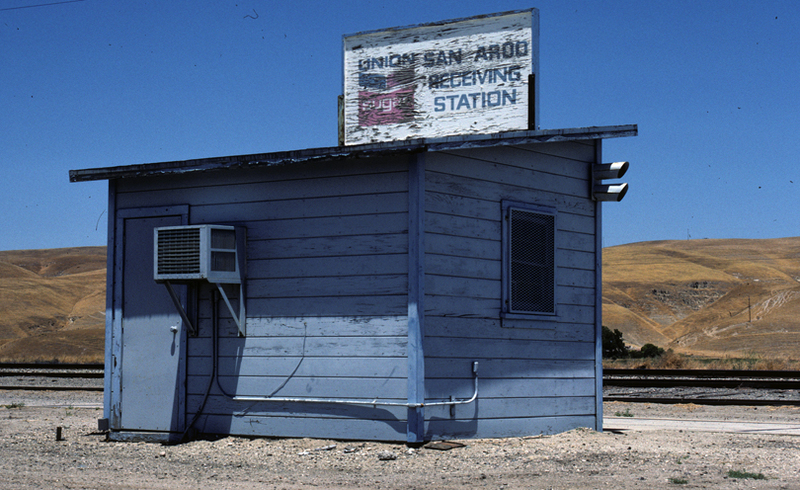 The model follows the structure at Sargent, California, still standing today though extensively vandalized and graffitied. Similar beet loaders were found in many growing areas. 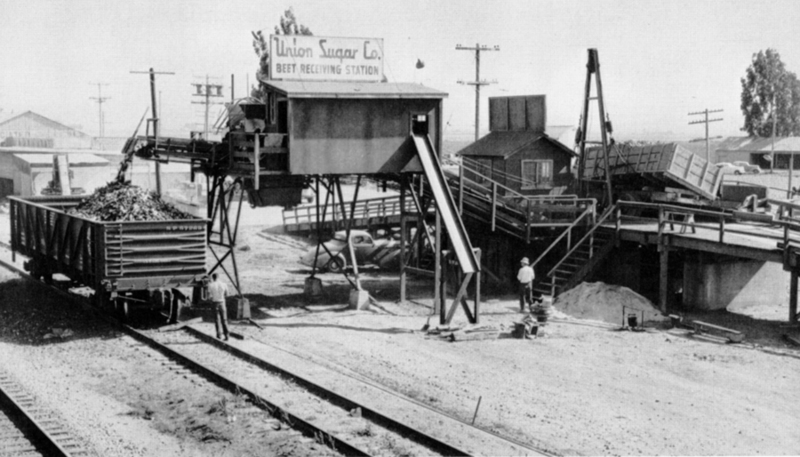 This one was owned by Union Sugar, and has their typical medium blue paint scheme. 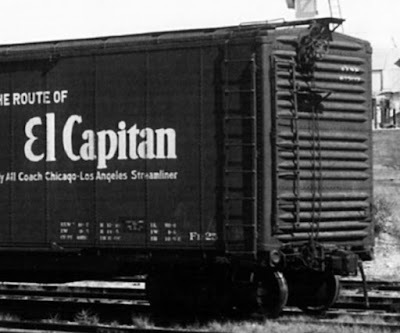 There have been some excellent prototype photos over the years of beet loaders, including several in my book about Southern Pacific gondolas (Volume 1 of the series, Southern Pacific Freight Cars). I will shown one example, from the Union beet loader at Cooper, near Salinas, California (Southern Pacific photo, 1948). You can click to enlarge. Note you see here the entire sequence: a truck body being dumped at right, with the triangular frame of the lifting cable above it, the office just to the left of the truck, and beets falling from the top of the loader into a gondola. The Tabler model is exquisitely rendered. Here is a view from what would be rail side of the structure. The lifter for truck bodies, and the receiving bin, are at left. The other side, with the concrete truck driveway, looks like this. Next, here is an overhead view to show the relationships among the components more clearly. 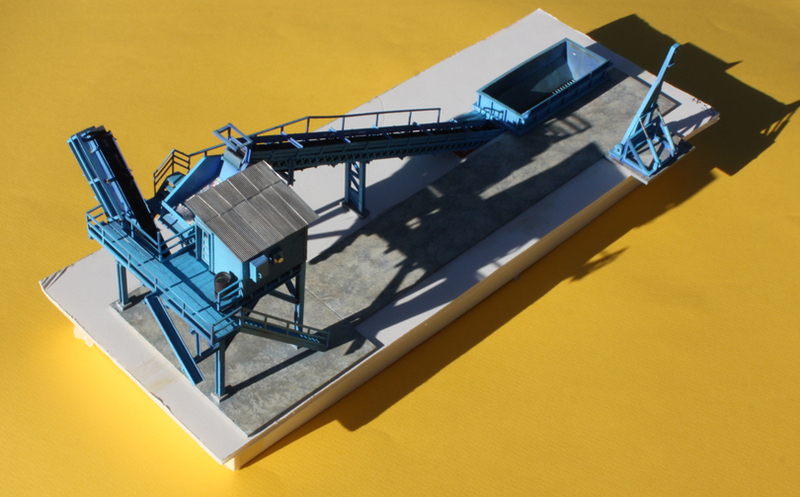 This next view from the end of the model nicely shows the structure at the top of the loading conveyor. Finally, here is the model office structure, which was off to one side from the loader. I really have enjoyed having time to examine this fine model and to photograph it. John Tabler deserves a lot of credit for the excellent modeling of this sugar beet loader.